Mankind will be performing live today at "Buddy Walk" to benefit Down Syndrome! All live! All Acoustic! All ROCK! Bring out your friends and let's help raise some awareness and maybe some money! Showing up at the landmark just after 5PM, I saw that the dance floor went across two sims, one third of it and the stage over the sim crossing from the other two thirds. 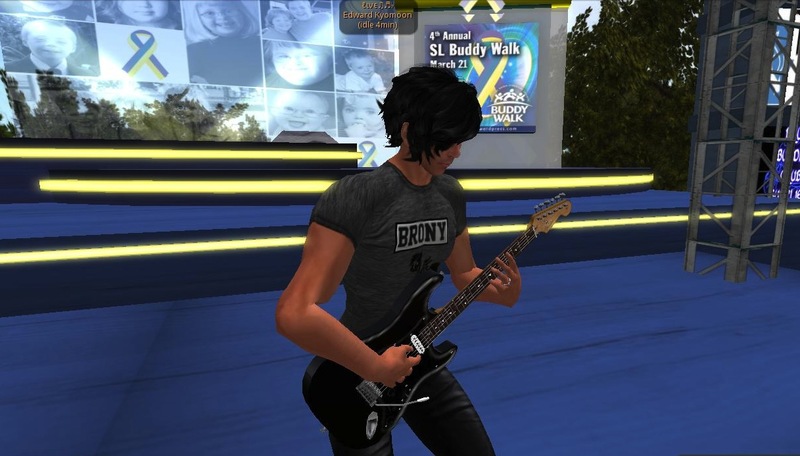 Maximillion Kleene was performing at the time to an enthusiastic audience, and just after 5:30PM the total raised hit 50,000 Lindens. People could donate to various kiosks set up around the place, "Donations collected from this event are given to NDSS! you can find the kiosks at the landing point, both sides of the venue entrance and both sides of the stage." Most Lindens donated went to the unit next to the stage which also gave the total amount. 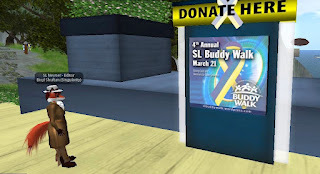 Both the volunteers and the dancers cheered each other on as the total went up, "We are so happy to see everyone today at the 4th Annual SL Buddy Walk," with occasional announcements going up. 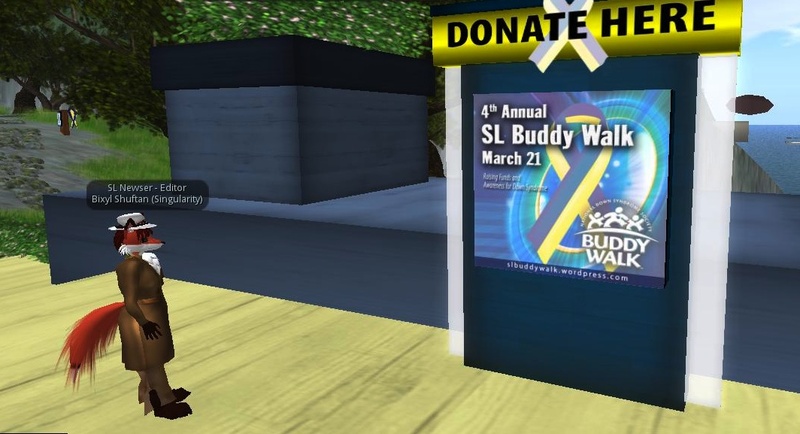 SL Buddy Walk Announcement shouts: ++++++++ There are more than 400,000 people living with Down syndrome in the United States. 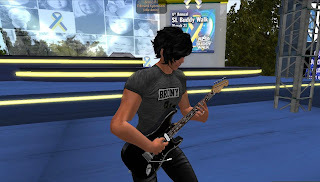 Checking in again just after 10 PM SL time, Edward Kyomoon was performing for the final hour. Volunteer JL Zinner shouted "We are at $136,673 raised..... our goal is to beat last year which was $156,000L. Just an hour left to do that!!" Taking a look at the main kiosk, the total was actually 139,674 Lindens. The final total, listed in the event's blog, was 143,283 Lindens, with 506 residents visiting that day. The stage was not a permanent set, and was gone the next day. The volunteers suggested three links on the Internet for people to check out, www.ndss.org , www.buddywalk.org , and www.worlddownsyndromeday.org . For pictures of the 2011 event, check the Flickr.